An economy of means characterizes this portrait. No element is superfluous. Each adds meaning and value to the work. Three-dimensional form is here limited to the human skin; i.e. the subject’s head, neck and hands. The contours of the clothing which covers his body, as well as his chair, are done in simple outlines. The figure sits upright but without rigidity, in an attitude that suggests resolve, decisiveness and reason. The face is presented frontally, as are the eyes, which regard the viewer serenely and thoughtfully. The head is highlighted by the oblique lines of the shoulders and right arm (on our left), which can be seen as pointing upwards toward the head or perhaps as the vital development of what this particular mind appears to be putting in order. 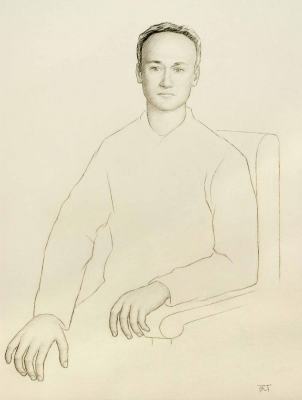 The left arm descends vertically, as if signifying self-assurance, control; the forearm lies parallel to the arm of the chair, while the overall posture suggests the attitude of someone who knows how to listen. The fingers, somewhere between curled and extended, and each seeming to be moving independently, denote multiplicity and give an image that accords with the conversational inclinations of the subject. To close the composition, lines fall from the preeminent head down the arms, with the angle of the left forearm finding resolution in the right hand, the most distant element to receive the impulse of the subject’s mind, in the lower left hand corner.